Shopping in Puerto Limon isn't exactly sophisticated, although there are a good number of souvenir stalls and shops scattered around the harbour area, aimed at the tourists who spend a day in the city as part of a Caribbean cruise. The various markets sell local handicrafts, as well as local produce, and are good places to spend time browsing. A few stores in Puerto Limon sell traditional handicrafts, but finer quality examples are found in Puerto Viejo and Tortuguero. Puerto Viejo, the largest tourist town on Costa Rica's Caribbean coast, is a good shopping destination if there are no plans to travel as far as San Jose. The outdoor craft market along the beach has a good selection of typical products and there are attractive small shops around the town, specialising in arts and crafts, several of which plough some of their profits back into the community. 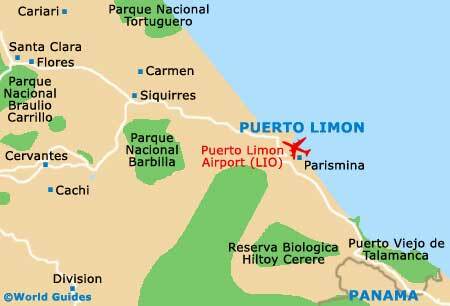 Where to shop in Puerto Limon depends very much on what you are looking to buy, as the city isn't set up as a tourist zone and is in one of the poorest areas in Costa Rica. For fresh food, fruit and vegetables, the local outdoor markets are the best places to shop, as you won't find large supermarkets giving a choice of foods here. Nor will you find department stores and shopping malls providing a choice of inexpensive goodies, although there are various good-quality souvenirs available in the city. Leatherware is good value in Puerto Limon, with shoes, handbags, purses and even jackets worth a look, and the locally-produced ceramics are colourful and fun. Wood carving is also a traditional craft here, and jewellery boxes with hidden compartments are a popular buy. Well-designed and crafted silver jewellery can be easily found at reasonable prices. More information about San Jose shopping.